This is the final part of The Big Move for now.... If you haven't read parts 1 through 3, this won't make nearly as much sense as if you had..
Friday, Dec. 15, 2017 - was the day of the Big Move for The Coupon Clippers! Went to the old fabric store to finish cleaning up. Since no one was emailing us much, Sarah and the little kids (Emma and Joan) and I all went over to the original QT office and started sweeping and preparing for the final move… We were going to finally get the coupons out of the larger building and into the smaller one, and we needed to get the final bit of fabric stuff out of the smaller building, so there wouldn’t be a collision. We still had a pile of miscellaneous stuff to get out of the old fabric store.. and we only had until 12:30 to get it 100% gone. We had already arranged for help to arrive then. it was a race! Of course, the girls (ages almost 2 and 3 years old) loved helping. Well, they were racing around in the empty space in a chair with wheels, anyway. The guys had finally gone back to their painting, as I had maxxed out the fabrics that were ready to be shelved and I had shelves left over. I had asked them to be back over to our two offices around 12:30, to help with this final push. And we went to town with moving the big stuff! 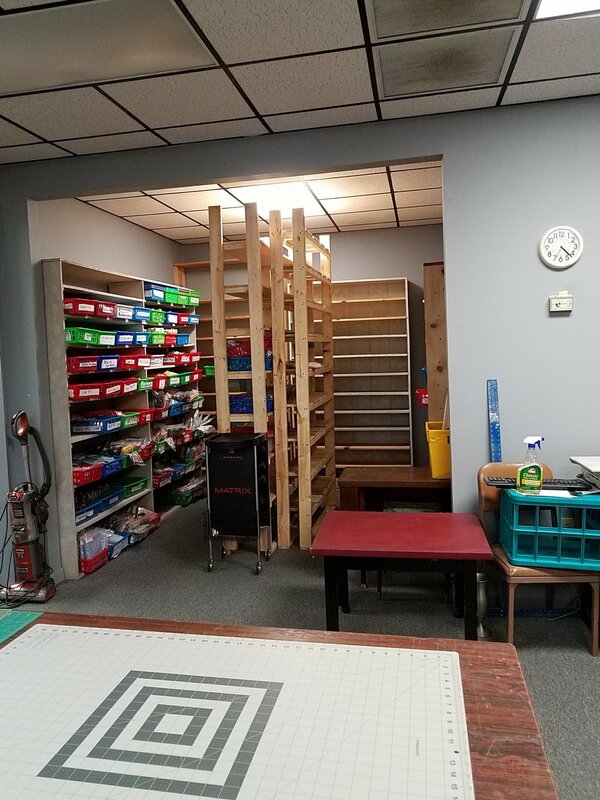 Finally… we would be able to stop working around coupon working stations and just get our shelves in place. 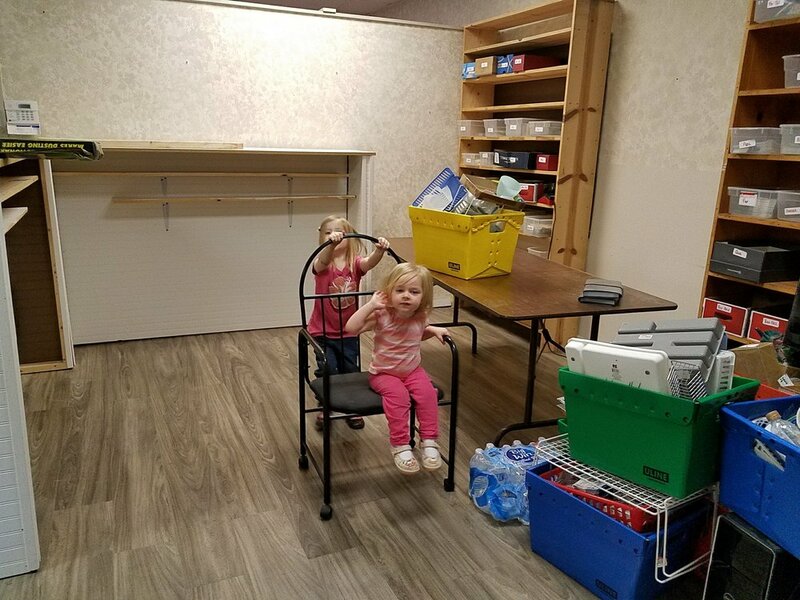 By noon, the ladies were finished with their coupon orders and they were able to disassemble their work stations, which consist of tables, storage shelves and mini moving tables and chairs. 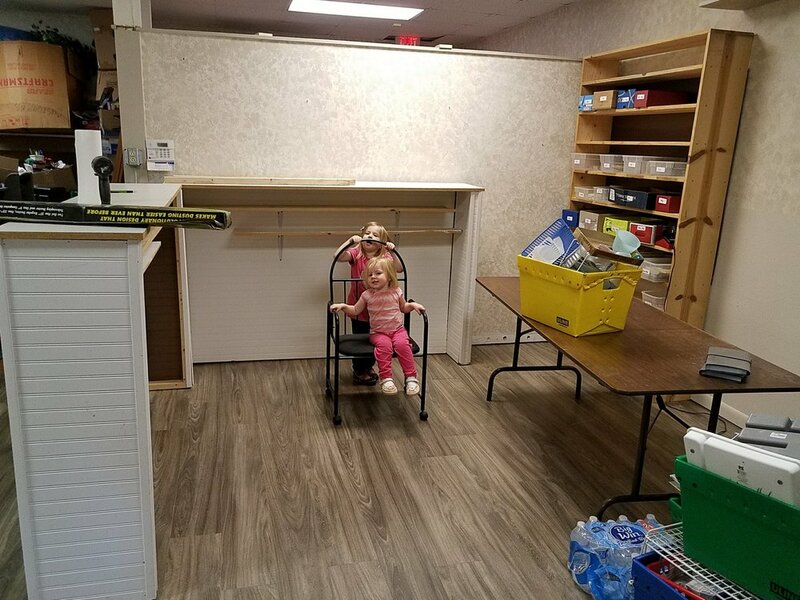 In the meantime, Sarah and the girls had been busily prepping the final stages of the old QT office, so that we could finally, finally, finally get their work stations out of the new larger building, so it would be cleared up for fabrics! Bringing things into the former fabric store meant that it was leaving the new one! It was a great time for rejoicing for me! I was finally starting to see spaces for all things fabric related! I was on the highest energy usage possible. Adrenalin was running high. There was an air of calm but sure excitement in the air! Everything was a mess. It was incredibly chaotic… Where do you put this while you’re putting THAT in THIS’s place? 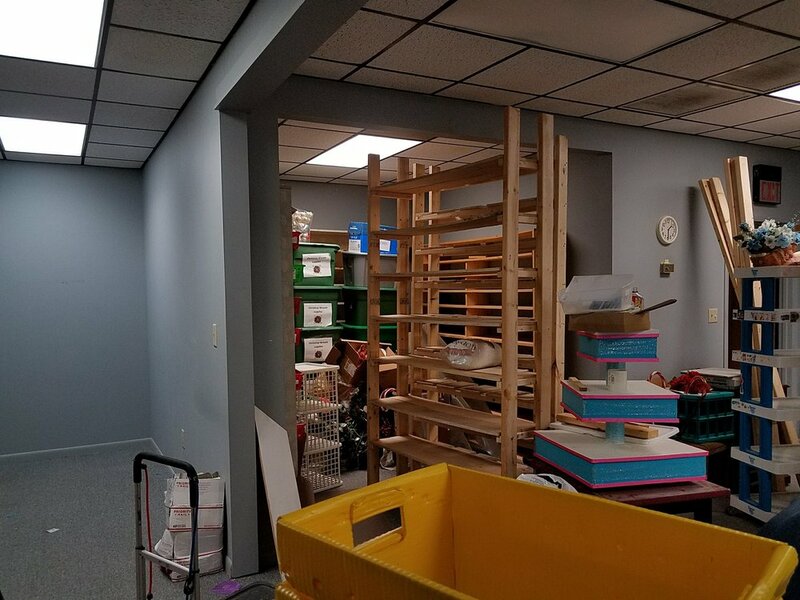 Some things would go out the back door and stay in the kitchen of the new place until the tables or shelving units were out of their locations. I’d zoom in with the vacuum cleaner to attempt to clean up paper dust before someone else set something else down. You can't tell it, but one of these rooms has become the backing and whites room! The other one has become the "pieces" room. it's lovely to have rooms for these areas. I forgot to eat lunch. So, by 2:30, I was totally out of steam, and decisions began to be difficult to make. I said, “I’ve got to stop and go eat lunch and take the mail in. So, I did. I came back at 3:20, refreshed and ready to bring it on in! Formerly this had been Cheryl's work space. This was our former fabric store. 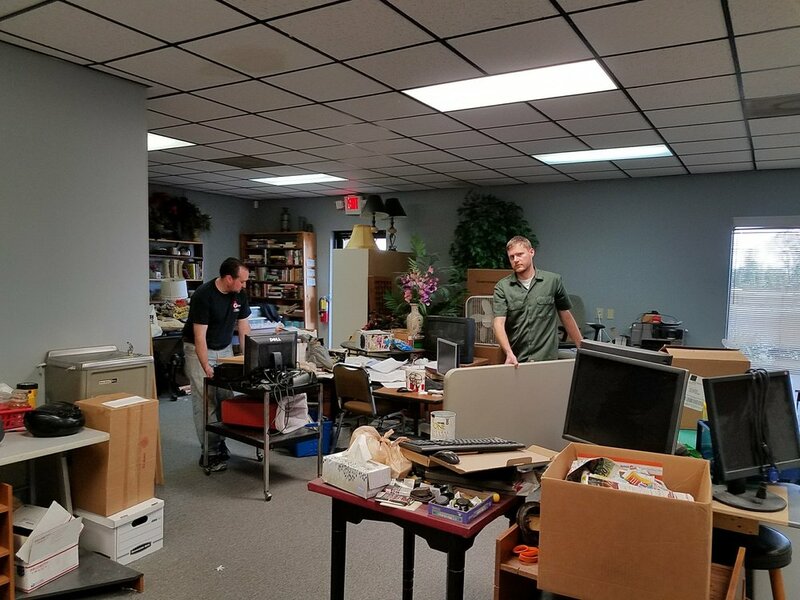 It was transformed into the perfect coupon room within a matter of about 6 hours last Friday! (once we got the fabrics out!) In the meantime, two doors down, we were putting things in place and making huge strides in organization! Room for all backings plus room for more! Pieces, fat quarters and half yard pieces are here now! I still have scads of organization to do, and about 500 more bolts of fabric to get up and over there, but at least now I have ROOM in which to put it once I do that! Once I get that done, I’ll get my house back and my husband will be incredibly relieved! A Panoramic view with a twist. As I turned when making the picture, it made the room appear curved. It's not. it's very square! It's awesome now! It's not done, but it's great! We have shelves for the fabrics that we have ready and two cutting tables! Oh no.. what’s that I hear? The Fed Ex truck pulling up just now? Oh yippeeee.. another fabric shipment…..
We are now ready for you to order fast and furiously! Check back often for beautiful fabrics at hugely discounted pricing!